Box Text: Join a Crystal Caravan! A deadly miasma has swallowed the land, and it's up to you to hold it at bay! Many dangers lie along your journey, but you need not face them alone. Enlist your friends in a crystal caravan and make your mark together in Crystal Chronicles! 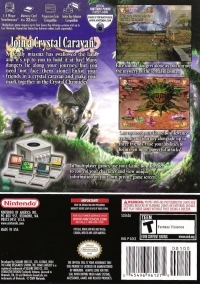 - ...or connect your Game Boy Advance systems and journey alongside up to three friends. Fuse your abilities to form even more powerful attacks! - In multiplayer games, use your Game Boy Advance to control your character and view unique information on your own private game screen! 10-22-2015 ub3rgoob3r Box Text Join a Crystal Caravan! A deadly miasma has swallowed the land, and it's up to you to hold it at bay! Many dangers lie along your journey, but you need not face them alone. Enlist your friends in a crystal caravan and make your mark together in Crystal Chronicles! - Face untold dangers alone as you unravel the mystery of the lethal miasma... - ...or connect your Game Boy Advance systems and journey alongside up to three friends. Fuse your abilities to form even more powerful attacks! - In multiplayer games, use your Game Boy Advance to control your character and view unique information on your own private game screen! 03-28-2013 st01c Box Text Join a Crystal Caravan! A deadly miasma has swallowed the land, and it's up to you to hold it at bay! Many dangers lie along your journey, but you need not face them alone. Enlist your friends in a crystal caravan and make your mark together in Crystal Chronicles! - Face untold dangers alone as you unravel the mystery of the lethal miasma... - ...or connect your Game Boy Advance systems and journey alongside up to three friends. Fuse your abilities to form even more powerful attacks! - In multiplayer games, use your Game Boy Advance to control your character and view unique information on your own private game screen! 09-06-2011 scott Description Up to 4 players can play simultaneously, but requires each player to link a Game Boy Advance to the GameCube. 09-06-2011 scott Box Text Join a Crystal Caravan! A deadly miasma has swallowed the land, and it's up to you to hold it at bay! Many dangers lie along your journey, but you need not face them alone. Enlist your friends in a crystal caravan and make your mark together in Crystal Chronicles! 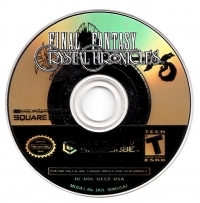 This is a list of VGCollect users who have Final Fantasy: Crystal Chronicles in their Collection. This is a list of VGCollect users who have Final Fantasy: Crystal Chronicles in their Sell List. 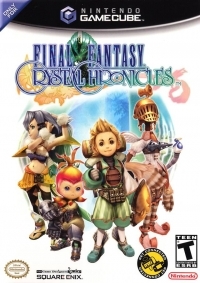 This is a list of VGCollect users who have Final Fantasy: Crystal Chronicles in their Wish List.